The hugely popular Christmas Festival Weekend is set to return to the historic High Street of Leighton Buzzard this weekend, starting on Friday (November 30). Organised by Leighton-Linslade Town Council in conjunction with LB First, the three-day event will provide something for everyone. Festivities begin at 4pm when the Christmas craft and gift market opens for business. Over 30 stalls have so far confirmed their attendance providing the opportunity to buy something unusual for family and friends. 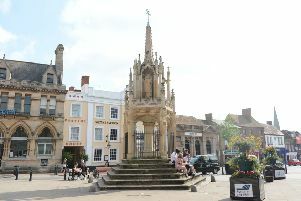 The ever-popular funfair will also be there as well as the scrumptious food court which can be found in Church Square. The main stage will provide live entertainment from local community groups. At 7pm, guests of honour including those nominated by the readers of the Leighton Buzzard Observer (Kye Vincent and Keith McAngus) will start Christmas proper with the turning on of the Christmas tree lights as well as the brand-new town centre lighting display. Thereafter, the skies will be lit up by a firework display. The fun doesn’t stop there as the entertainment continues on the main stage with “The Catch” headliners offering live music. On Saturday, hundreds of Santas will descend on the town to take part in the annual Kids Out Santa dash organised by Leighton Fun Runners which starts in Church Square at 11am. Festive entertainment alongside the charter market can be found in the High Street throughout the day. Sunday welcomes back the Christmas Craft and Gift Market between 11am and 3pm. The Leighton-Linslade Concert Band, Victorian Carol Singers, Jones and Barnard as well as the Giant Elves will also be there. In addition, there will be an opportunity to have a family photo in a giant snow globe, take home a balloon model or make Christmas biscuits with the demonstrators and entertainers in the town centre throughout the day. If you would like more information about the Leighton-Linslade Christmas Festival Weekend see visit the Leighton-Linslade Town Council website www.leightonlinslade-tc.gov.uk, or email events@leightonlinslade-tc.gov.uk. All attractions and entertainment correct at time of publication.